Ten years ago, many of us assumed that ebooks would make traditional books obsolete. While more of us are going paperless these days, we’ll always have a soft spot for paper books and the shelves that hold them. There’s something so viscerally satisfying about walking into a room lined with books of all colors and sizes. Part of their appeal is the wide array of storage and display options we choose to put them on. 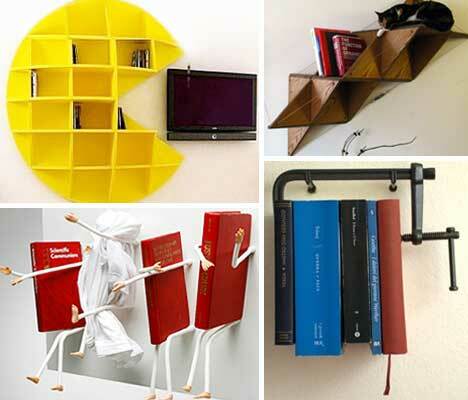 These incredible bookshelf designs not only store your books; they add a touch of style and character to your home. For people who really love their books, the Movement book storage system lets you give them love even when you’re not around. 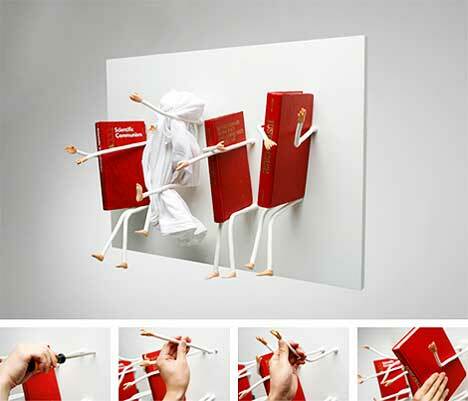 Pegs in the shape of arms and legs to into the wall, then books sit on the legs and enjoy the warm embrace of the arms. This may not be the wisest solution for a large collection, but it looks ideal for displaying just a few well-loved favorites. Just about everyone will instantly recognize the simple yellow face of Pac-Man…but for legal purposes, this version is called Puckman. The bright yellow bookcase hangs on the wall, holding anything you need it to and adding a definite sense of nostalgia to anyone who spent hours playing the classic game. The hilarious Puckman bookcase might eat your TV, but he’ll keep you safe from the Ghosty Lamps also made by Ginepro Design. 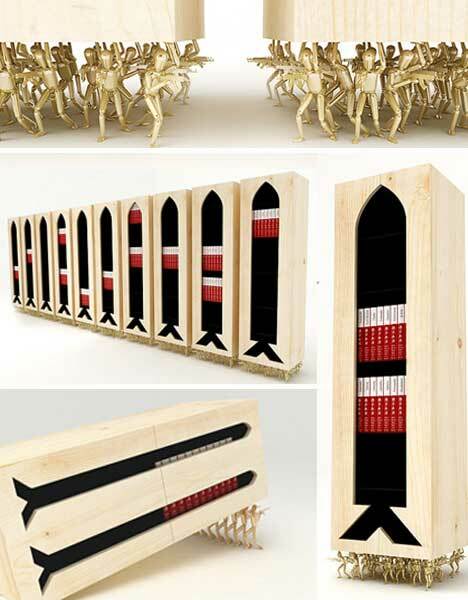 Inspired by global events related to missile tests, the designer behind Daniel Loves Objects created these amazing bookshelves. Carried upon the backs of tiny golden toy soldiers, the cases bear images of missiles – and numerous copies of Sun Tzu’s The Art of War. Part art, part political commentary, and all outstanding design, these shelves would be ideal both for storing your tomes and for starting conversations. These two designs from David Garcia playfully twist our perceptions of reading. The first, Archive I, is a balanced library: the reader’s chair is elevated, and the library has to be at least as heavy as the reader for the chair to remain in its heightened position. The round library, Archive II, is a throwback to the traveling libraries of days gone by: a simple concept that invites users to take their library with them as they explore the world with a book in hand. Small-space dwellers can appreciate the need for furniture that gets smaller when necessary but is able to grow as space allows. 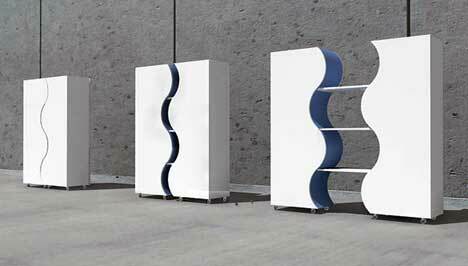 The Twin Bookshelf does just that, with stationary shelves in both halves of the case and a third set of shelves that appear when the two sides of the cabinet are pulled apart. 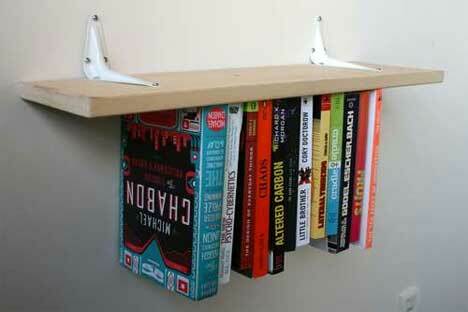 It’s a simple but brilliant solution for adding more space as a book collection grows. Waking up to walls full of books every morning is every bibliophile’s dream. 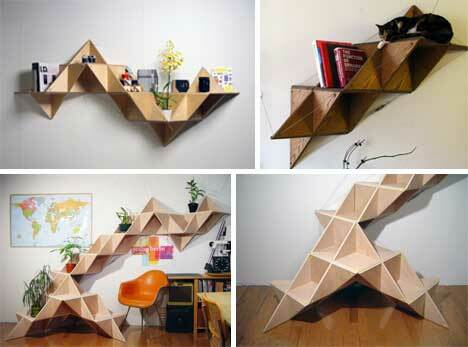 But how do you make the shelves fit your living space? These clever solutions both involve massive built-in bookcases that cover almost every wall. The first is a small-home solution from DBD design + built studio and consists of custom-cut, built-in-place bookshelves that make use of every available inch of area. The bottom design was built in a rather large living area by Triptyque. Though the sizes of the spaces differ, the idea is the same: to provide more than enough space to store every last book, record and knick knack on organically undulating surfaces. 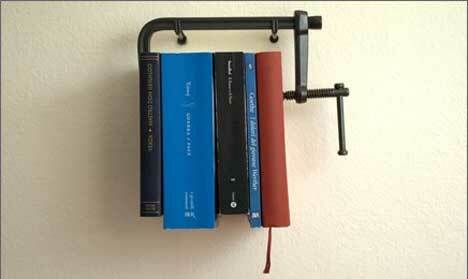 Who says book shelves have to be rigid wooden or metal structures? This soft hammock-like hanging bookshelf cradles your books and magazines with all the care you’d expect from fabric, while the expandable structure divides a room or just provides some wonderfully unique visual interest. 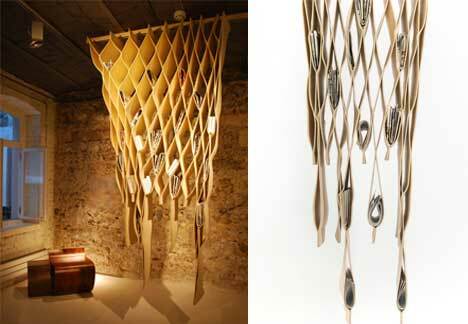 This stunning spider web-like bookshelf was the focal point of an exhibit at Art Basel in December 2008. The simple black lines and geometric patterns might not go in every home, but the book collection would certainly be the centerpiece of any home with a storage system like this. Not every home would look great with a big white polar bear in it, but for the home with a safari room this bookshelf is right on the money. 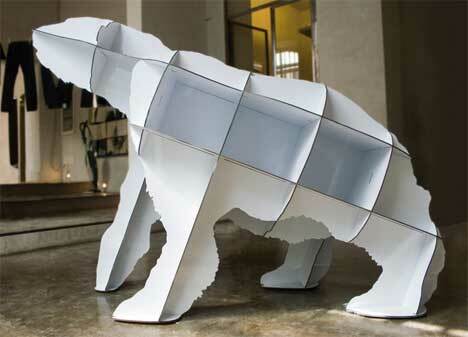 The large, adorable bear-shaped shelves hold books and other objects while proclaiming to the world that you care about the dwindling polar bear population. 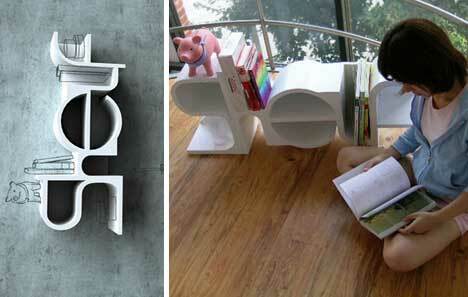 What do you get when you combine bookcases, comfy seats and wheels? 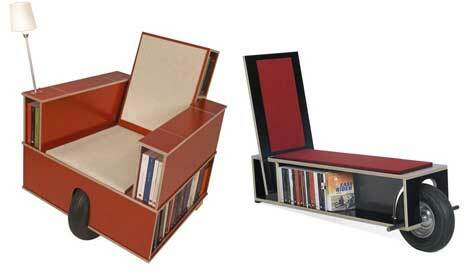 You get portable storage that doubles as a relaxing reading space. 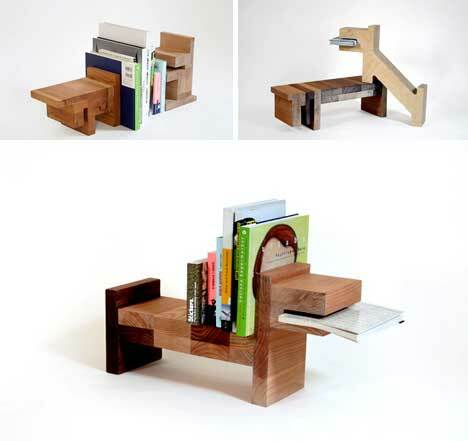 These designs, both from Nils Holger Moorman, let you follow (or avoid) the sun by moving your reading space around to the optimal location. The lounge chair even comes with a built-in lamp, further enhancing the portable reading experience. No Reading at the Dinner Table! Those of us who grew up with a book semi-permanently attached to our hands have heard the above proclamation millions of times. 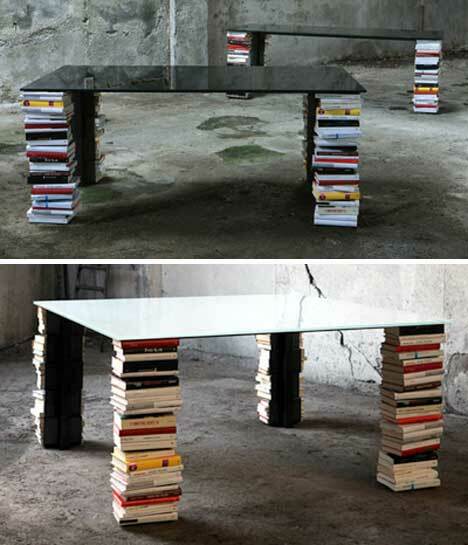 But the ex-libris table design defies parental orders and encourages reading at the table. The bookshelf legs provide ample storage for any and every book you could possibly need while dining; cookbooks would be an especially wonderful (if slightly obvious) choice for this setting. 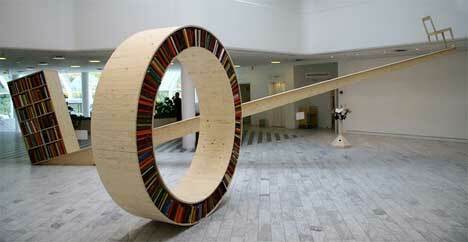 If reading is much more than just a casual hobby for you, it makes sense to erect a monument to your books. 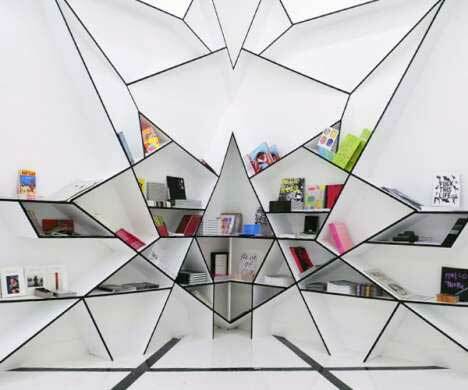 These massive silver pyramid bookshelves are fit for pharaohs – or anyone with a home large enough to accommodate them. 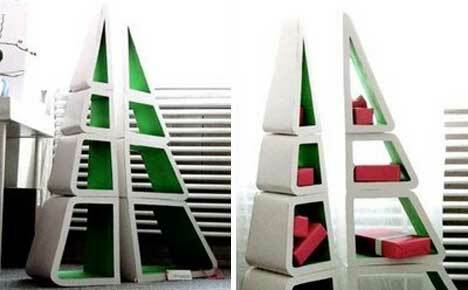 Whether you celebrate Christmas or not, these clever tree-shaped bookshelves would look great all year ’round. Smaller objects or magazines could occupy the top levels while larger tomes would be relegated to the bottom, and when the holidays roll around you can simply replace the books with ornaments or gifts for a needle-free tree. Moving frequently can be hard on bookshelves, as anyone who has ever tried to disassemble and reassemble an Ikea bookshelf can attest to. But the Knockdown Bookcase is meant to be taken down and rebuilt over and over again with no tools and no hassle. The pieces simply slot together, so you can go from a box full of pieces to a fully assembled bookshelf in literally minutes. You know the kind of person who prints out labels for everything in their home? 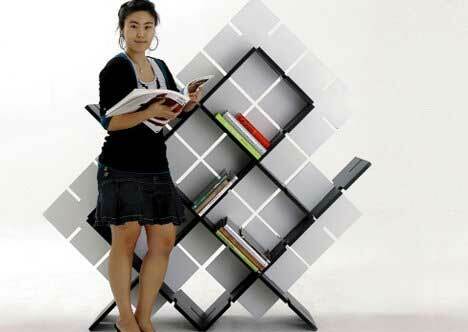 This is the bookshelf for them. 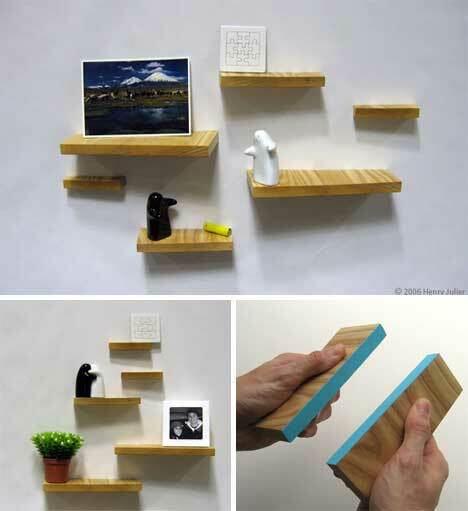 The shelf is actually made of letters that spell out the word “shelf,” leaving absolutely no doubt as to what that thing hanging on the wall might be. 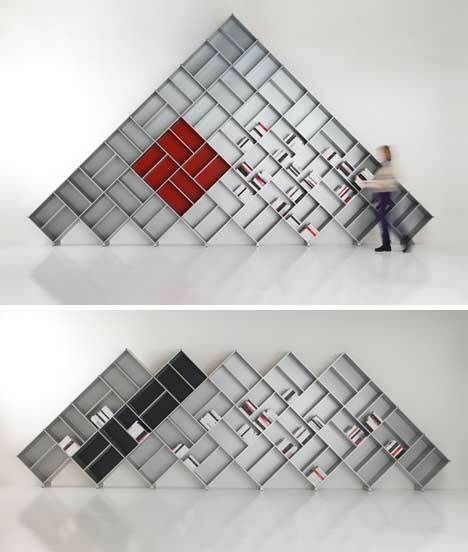 You can’t always fit a large bookshelf into a living area, so Henry Julier designed the Magneto shelving system: each piece of wood contains super-strong neodymium magnets that allow the shelves to stick to fridges, whiteboards or other surfaces. They may not be strong enough to hold up your entire book collection, but they’re perfect for sticking a few up here and there. One of the best things about having a sizable book collection is sharing it with friends and family. 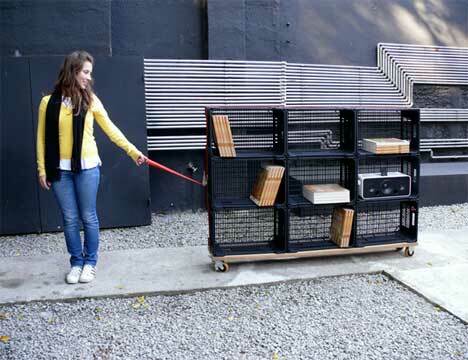 This mobile bookcase design lets you do more than that: you can haul your books around behind you, becoming your own mobile library. Quitante, by estudio, is a simple design consisting of fruit crates, cargo straps, plywood and castors – and it’s completely brilliant. If you’re the DIY type, and you have a sense of humor about your books, this unconventional storage solution might be just your thing. Without harming your books, you can create a fun upside-down shelf to display them – and you can even use the “bottom” of the shelf for storing other objects: double your fun! 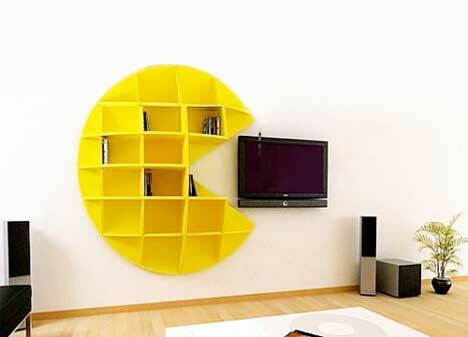 Every geek should have at least one video game-themed piece of furniture. 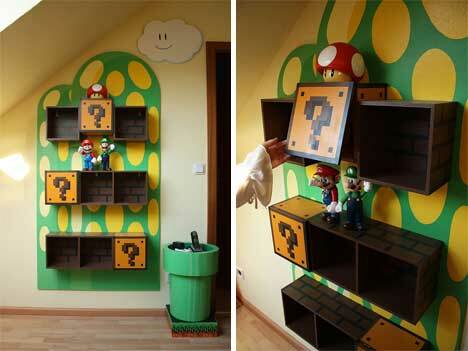 These amazing Super Mario Brothers shelves aren’t available commercially; they were a DIY project and reside in a very lucky person’s home.